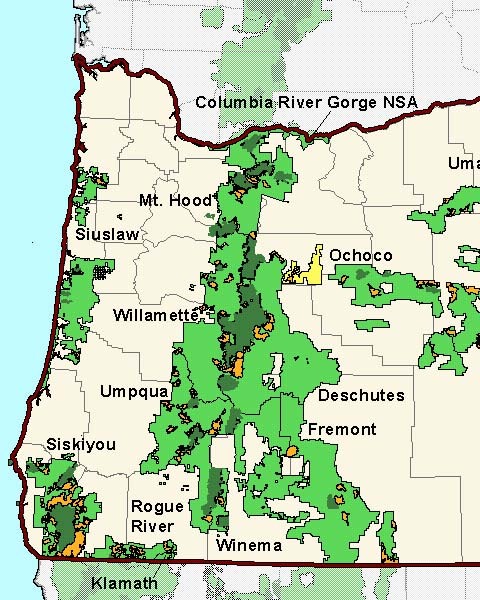 Learn more about Oregon's National Forests and proposed roadless areas. View the complete Oregon forest map here. Oregon rainfall map here. On January 5, 2001 President Bill Clinton approved [3410-11] DEPARTMENT OF AGRICULTURE Forest Service 36 CFR Part 294 RIN 0596-AB77. Special Areas; Roadless Area Conservation AGENCY: Forest Service, USDA. ACTION: Final rule and record of decision. SUMMARY: The Department of Agriculture is adopting this final rule to establish prohibitions on road construction, road reconstruction, and timber harvesting in inventoried roadless areas on National Forest System lands. The intent of this final rule is to provide lasting protection for inventoried roadless areas within the National Forest System in the context of multiple-use management. The Department of Agriculture is adopting this final rule to protect and conserve inventoried roadless areas on National Forest System lands. To protect health and safety in cases of an imminent threat of flood, fire, or other catastrophic event that, without intervention, would cause the loss of life or property. To conduct environmental clean up required by federal law. To allow for reserved or outstanding rights provided for by statute or treaty. To prevent irreparable resource damage by an existing road. To rectify existing hazardous road conditions. Where a road is part of a Federal Aid Highway project. Where a road is needed in conjunction with the continuation, extension, or renewal of a mineral lease on lands that are under lease, or for new leases issued immediately upon expiration of an existing lease. For the cutting, sale, or removal of generally small diameter trees which maintains or improves roadless characteristics and: To improve habitat for threatened, endangered, proposed, or sensitive species, or To maintain or restore ecosystem composition and structure, such as reducing the risk of uncharacteristic wildfire effects. When incidental to the accomplishment of a management activity not otherwise prohibited by this rule. For personal or administrative use. Where roadless characteristics have been substantially altered in a portion of an inventoried roadless area due to the construction of a classified road and subsequent timber harvest occurring after the area was designated an inventoried roadless area and prior to the publication date of this rule. 3) Applies immediately to the Tongass National Forest. Includes a transition provision that allows projects that have published a Notice of Availability for a draft environmental impact statement by the date of publication of the Final Rule to continue. The Roadless Rule protects 58.5 million acres, or 31% of National Forest System (NFS) lands, about 2% of the total land base of the United States."